(CNN) – When Bob Satterfield was growing up in Georgia, he and his cousins used to play a game. [2:36] "We'd be squirrel hunting but, if we saw mistletoe, we'd start shooting at that too." Satterfield says they'd run to see if they could catch the plant before it hit the ground. These days though he uses a more conventional method to harvest the plant. [3:09] "I actually just knocked it down with a pole you can't shoot around here too much anymore too populated too many people and if you shoot a gun it's what comes up most go down." This time of year many folks are trying to get their hands on this evergreen sprig. But those who find it in their trees might do well to pay attention to it year round. That's because mistletoe is a quasi-parasitic plant. It saps energy from trees and can eventually kill them. In landscapes where many leaves turn brown and fall off, mistletoe bunches stand out, bright green in the branches of trees. Mistletoe actually got its start as a holiday decoration because it stood out. Dr. Ronald Hutton studies British customs and history and has penned over a dozen books. 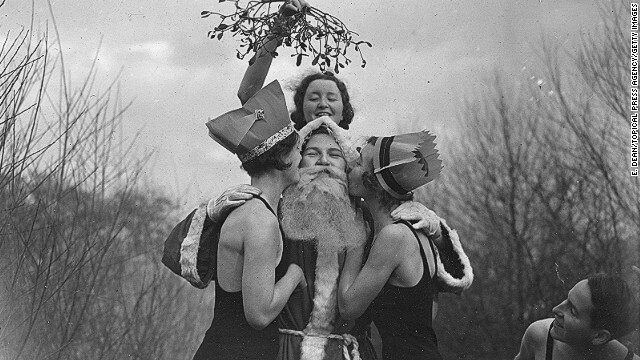 He says mistletoe first appeared in Great Britain Christmas tradition in the early 18th century. Initially people merely included mistletoe in a larger display of winter greens like holly and ivy. [1:55] "The custom of kissing under the mistletoe arises in London in the late 18th century it's about as old as America itself and it originates among servants below the stairs in quite rich homes in London."